(Vatican) Pope Francis received representatives of the Simon Wiesenthal Center in audience today. On this occasion, the Catholic Pontiff recalled the "suffering exclusion and real persecution" of many Christians around the world. He also reiterated his condemnation of "any form of anti-Semitism." The Pope expressed his "appreciation" for the work of the Simon Wiesenthal Center , "to combat all forms of racism, intolerance and anti-Semitism, to keep alive the memory of the Shoah, and to promote mutual understanding through education and social commitment". Pope Francis reaffirmed the importance to pass on to younger generations, "not only the knowledge of the history of Jewish-Catholic dialogue about the difficulties experienced and the progress made in recent decades." It is applicable "above all" in order "to convey passion for the encounter with the other and get to know, through the promotion of an active and responsible involvement of our youth." The Pope also said: "I encourage you to continue the to value you in the joint effort to convey, to reject walls and build bridges between our cultures and faith traditions." In addition to a larger number of messages and letters to Jewish institutions it was the fourth meeting with senior Jewish officials within four months, in which Pope Francis issued a clear rejection of anti-Semitism and emphasized Catholic-Jewish friendship emphasized. We kicked off the audience for the International Jewish Committee for Interreligious Consultatations (IJCIC) last June. At that time, the Pope described the Jews as "elder brothers" of Christians and said, "Because of our common roots, a Christian can not be an anti-Semite" He stressed the long friendship between Christians and Jews, and encouraged continuation on this path. On the 2nd of September, Francis received the leadership of the World Jewish Congress (WJC) under the WJC President Ronald Lauder. The Pope reiterated his statements made ​​in June and added, "To be a good Christian, it is necessary to understand Jewish tradition and history." Francis recalls Catholics helping Jews during the War under the Direction of Pope Pius XII. 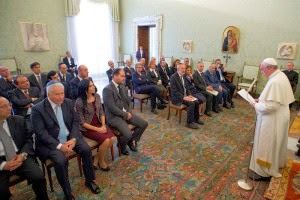 On the 11th of October the Pope received a delegation from the Jewish Community of Rome, whom he addresses as "beloved friends". The "oldest" Jewish community in "Western Europe", had often experienced "misunderstanding and real injustices" in the past two thousand years. "But with God's help" we have made ​​"friendly and brotherly relations for many decades," the Pope said. He recalls the help of many Catholics for the Jews during the Second World War and the fact that "many monasteries, institutes and papal basilicas at the request of the Pope" accepted Jews. In this context, Pope Francis identified this as "grace, a grace because it was" that he could afford as Archbishop of Buenos Aires, a contribution to the "closeness and friendship" with the Jewish community. It was shortly after his inauguration into office on March 22nd that a first meeting of the new pope with a Jewish delegation took place. Israeli President, Shimon Peres was the first head of state Pope Francis received in audience after his election. The meeting was held last April 30th.